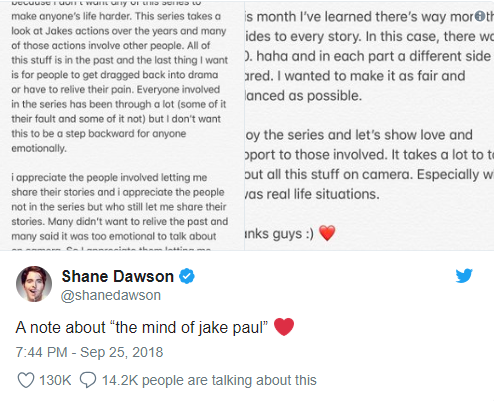 Everything you might have missed from the Shane Dawson series of The Mind of Jake Paul in a two part article series! Here's a breakdown of the series EVERYONE has been obsessed with lately! Click on each of the episode titles within the article to go and watch the episode! In this segment, Shane revealed that he would be talking to several people throughout the series, including members of Jake's family, current friends, and people he has had fallout's with. In the first video, Shane talked to the YouTube critic INabber to try to understand more about Team 10. INabber revealed members of Team 10 have paid to be a part of the group, including signing contacts that give Jake a percentage of the income they make. He also mentions how his family, and how his brother, Logan Paul, is likely influenced by Jake's behaviour to create crazy videos. Throughout the episode, Shane explores why Jake acts the way he does. Shane also added a video featuring Jake and his father, Greg Paul, from an old video that was made after the 'Secret Service' came to his house after he hid in the White House. Greg didn't punish Jake at all, however congratulated Jake on getting good material and content for his videos. 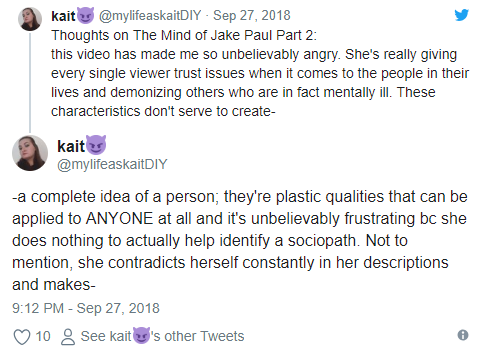 In 'The Dark Side of Jake Paul', Shane interviews YouTuber and clinical therapist Kati Morton about what defines a sociopath. Describing sociopaths as a "roller-coaster", Morton explains typical characteristics that somebody with antisocial personality disorder might embody. As she dives into sociopaths traits, the episode cuts to scenes from the Paul brothers' videos. - When discussing the tendency to mimic socially acceptable behaviors instead of understanding them. Many people reached to twitter to give their thoughts as viewers did not agree with the episode. In the third part of the documentary-series, Shane began to investigate 'The Family of Jake Paul'. Shane Dawson sat down in front of the television and began to look back at Jake Paul's older videos, the viewers will begin to piece together that Jake and Logan's father, Greg Paul has raised them in a certain way. This made many followers to begin feeling sympathy for them both. - While watching many of the brothers' videos, we can now see how much of an involvement Greg has been with his sons career's, which has become very unhealthy. Many of the former Team 10 members report that Greg was verbally abusive, and has cost the group a lot of money. Shane then goes onto watching a video another YouTuber has uploaded in which they did their own investigation into the Paul's, and while watching this, we finally see where the Paul's get their attitude to work from. "Vlogdad", is full of 'Savage' workouts, and a completely different lifestyle which is evident that the sons try to follow and replicate. - In one of the videos, we see Greg kissing a younger girl to prove himself as a better kisser. Although sources claim that the girl was of legal age, a teenager watching this video would have definitely gotten the creeps. In this episode, Shane Dawson interviews England is my city meme star Nick Crompton, who does not hold back anything. This then moved onto whether the drama between Jake Paul and Alissa Violet was fake too? - Alissa and Jake were dating for many months, then all of a sudden Jake kicked her out of the Team 10 house. Alissa wanted revenge, and started claiming that she had slept with Logan Paul. 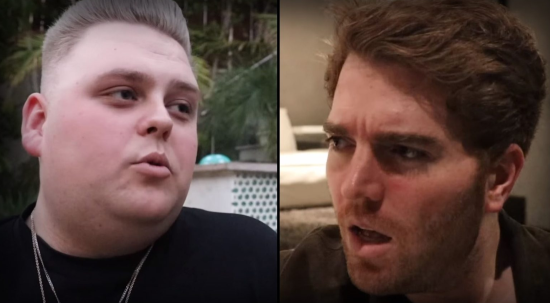 Nick Crompton revealed that Alissa did infact sleep with Logan Paul, which has impacted massively on Jake Paul's life, and his trust. Nick also included that himself and Jake no longer speak since he moved out of the Team 10 house, and after leaving the team. - He mentioned that this is something that Jake does to all former members of the team. Be sure to check back tomorrow, where The Mind of jake paul - recap: part two will be released!